Camping season doesn’t end when winter comes knocking in Georgia. In fact, some may argue that cold weather heralds the beginning of the best time to camp in the Peach State. Despite being in the south, it does get fairly chilly in Georgia during the winter, which means you’ll need a cozy camping cabin to complete the experience. Find your home away from home at one of these great winter cabin camping spots in Georgia. Don’t let the name mislead you—this RV park is just as dedicated to cabins and “glamping” experiences, too. Nestled along the Tallulah River, winter camping is ideal here because of its proximity to famed Tallulah Gorge. The trails at the gorge are considerably less crowded when the weather cools, so you can get unobstructed views of the majestic Tallulah Falls and surrounding areas. Ideal for families and couples alike, this quiet getaway spot offers no shortage of amazing nature views. Rated as one of the top 100 camping destinations in the U.S., you’ll discover trails leading to waterfalls, trout fishing, and wildlife all around. Each of their cabins are on or near the stream and feature a full kitchen and bathroom, heat, linens, towels, fire pit, grill, and deck. Quiet and laid back, Under the Hemlock is the camping destination when you want to get away from it all. There’s not much to do on site but relax, but the tallest waterfall on this side of the Mississippi is just a mile away inside the Amicalola Falls State Park. But don’t feel like you’ll be all alone—wildlife has been known to frequent the campground. With a name like Mistletoe, the winter camping here just has to be good. The park is known across the country for its bass fishing, and also offers biking trails, nature trails, and a sandy beach (though the lake will be too cold to swim). The park offers 10 cottages for rent (five on the lake) and one tent cabin, so make sure you book early to guarantee availability. This family-friendly campground is based on the picnic basket-stealing Yogi Bear and friends, but you can rest assured your food will be safe during your stay. Fun for kids and adults alike, the park is chock full of amenities, like mini golf, gem mining, horseshoe pit, playground, and arcade. Since Yogi will be hibernating and most kids will be back in school, winter is the perfect time to visit if you want a little peace and quiet with your R&R. Just a stone’s throw from beautiful Savannah, this park is a natural wonder in its own right. Birds like egrets and ibises gather here frequently to delight park visitors. The campground is in close proximity to day trip destinations like Jekyll Island and Tybee Island, not to mention the Savannah historic district. It’s got a funny name, but this cabin rental spot has a lot more to offer its guests. Known as an epic stargazing spot, the private campground sits across from the famed Okefenokee Swamp that offers endless wildlife viewing and exploring. You may never need to leave the campground, as there are tons of activities on site, like horseshoes, game room, movie & book nooks, and fireplace. This mountain bike getaway offers the best in cabin camping and biking. You bring the bike, and they handle the other details. This isn’t your typical cabin camping experience. Someone else handles all the meals that you’ll enjoy with the other guests. Their guides offer personalized trail mapping to suit your skill level. Plus, the resort features hot tubs, fire pits, and other amenities that are head and shoulders above your typical camping trip. Cabins range in capacity up to six people. Take your pick of cabin or yurt and enjoy an old-fashioned state park camping experience. Activities for campers include disc golf, geocaching, and over 20 miles of hiking trails to ensure you never run out of things to do. Hiking during the winter in Georgia is a completely different experience than summertime walks in the woods. Aside from the obvious changes in temperature, those willing to brave the chillier air can expect amazing rewards that just aren’t possible in warmer months, like potentially frozen waterfalls and sweeping vistas that are typically obscured by plant life. You won’t want to miss your chance of experiencing these nine best winter hikes in Georgia! Easily one of Georgia’s most scenic spots, the Waterfalls Trail takes you to a magical winter wonderland when temperatures drop. Tucked inside the Cloudland Canyon State Park, this trail leads you to two waterfalls that are often glistening in their frozen state during the winter. It’s a strenuous, two-mile hike, but the rewarding views are well worth the effort. For an energizing hike with the best views of the Atlanta skyline, head to Kennesaw Mountain and make your way to the top. Switchbacks are frequent on this loop trail as you pass through Civil War battlefields. The low vegetation growth in the winter months make it easier to see the skyline as you climb to the summit, giving you fantastic views all along the way. Despite being in one of the chillier parts of the state, Raven Cliff Falls still boasts plenty of green signs of life during the winter. This 6.6-mile out-and-back hike takes you to beautiful Raven Cliff Falls that slices through a looming rock outcrop. If you’re looking for a backpack camping experiences, the banks of the stream have become a favorite spot for many. Sweetwater Creek State Park features a number of great trails, but the White Trail is the historical one that takes you to the ruins of the old textile mill that burned during the Civil War. The White Trail intersects with several of the other trails in the park for you to make your hike as long or short as you like. This trail is ideal for winter hikes because each of its loops offer excellent stand-alone day hikes. Pine Mountain’s historical significance makes it attractive to tourists, as there’s much to see and do both on and off the trails. You can get a permit to camp along the trail if the cold weather doesn’t bother you—and it does get quite chilly here! This easy 1.5-mile loop inside General Coffee State Park gives you a great chance of glimpsing the protected Gopher tortoise and threatened Indigo snake. Winter is ideal for traveling this trail because it’s located in the driest area of the park, which makes it extremely hot during the summer. Tucked in the southeastern corner of Georgia, Woodbine enjoys slightly warmer temperatures than the mountainous regions of North Georgia, which makes winter hiking here an obvious must-do. This small section of a growing rail trail allows hikers to travel on a defunct rail line that’s been transformed to the point where you may never have known that trains were once rules of this space. This short one-mile trail is far from simple. Starting at the base of Stone Mountain, you’ll gain elevation with every step until you reach the top. People enjoy this steep set of steps year-round, but the lack of Georgia summer heat in the winter makes it a preferred time for many. Tucked away in beautiful Sky Valley roars a 100-foot waterfall that you deserve to find. This one-mile trail is considered easy, offering mulched terrain all the way to the falls. You’ll need to come back the way you came, which adds another mile to your trip. Georgia’s “highest state park” is truly a sight to behold. With views spanning over 80 miles in every direction, multiple hiking trails, waterfalls, and no shortage of things to see and do, this mountaintop retreat makes for the perfect winter weekend getaway. Here’s how you can make the most of your visit to Black Rock Mountain State Park. Black Rock Mountain State Park offers plenty of camping within the park, including cottages and tent, trailer, and RV sites. Tent sites are spacious, offering plenty of walk-in space and added privacy. If you’re feeling extra adventurous, consider grabbing a backcountry campsite that really feels like you’re in the middle of nowhere. With 11 miles of trails in varying ranges of difficulty, you can get explore the area in the best possible way. The backcountry trails are among the most challenging, but also the most rewarding. Views of streams, waterfalls, lakes, and forests surround you every step of the way, and without foliage blocking your view, you’ll be able to see it all. This growing trend is popular at Black Rock Mountain, with dozens of caches throughout the park. This old-fashioned treasure hunt lets you discover hidden areas where prizes have been stashed. Take it, then leave one for the next person. Just because it’s cold out doesn’t mean all water activities are off limits. Bring your own canoe or kayak and launch it in the small lake to experience the park in a whole new way. The 17-acre lake is perfect for a casual paddling trip while you soak up the sights and sounds of nature. Speaking of the lake, it’s also a prime spot for winter fishing. There are various streams and rivers making Lake Chatuge abundant in trout for fishing—so one of your camping meals just might be “free.” Be sure that you have your fishing license on hand and are familiar with Georgia’s laws and regulations surrounding the sport of fishing. This iconic North Georgia restaurant is family-style country cookin’ at its finest. This piece of history offers sweeping views of rolling hills and majestic mountains, along with homemade everything that never skimps on quality. They also offer on-site accommodations, a small zoo, horseback riding, trout fishing, and other family-friendly activities. This unique little antique store is brimming with interesting finds. Inside you’ll find tools and treasures of old that illustrate what life was like in the Georgia mountains decades (or more!) ago. Think of it as an old-fashioned general store, history museum, and gift shop all rolled into one. Not far from the park, you can grab a delicious meal at Clark’s on Main. Take a seat on their rooftop deck for beautiful mountain views (if it’s not too cold!) or sit in their warm, cozy bar area for fresh wings, appetizers, salads, burgers, tacos, and more. The homey atmosphere is warm and inviting, and will make you feel like part of the family. Travel south from Black Rock Mountain State Park to experience some of the best honey you’ve ever had. This sweet spot makes several flavors of honey with their own bee colonies, as well as provide all the tools you need to start your own beekeeping at home. You can sign up for classes, or simply grab a few bottles of tasty honey to take home with you. One of the most unique roadside attractions in Northeast Georgia, Goats on the Roof makes the perfect pit stop to grab a snack and stretch your legs. Their family of goats are roaming the whimsical structures that frame the outside. Inside you’ll find fresh ice cream, boiled peanuts, souvenirs, a playground, and a full-service cafe with kid-friendly eats. Georgia’s picturesque scenery and abundance of outdoor activities make it a prime vacation destination for all ages. It doesn’t cost much to enjoy a few days in the great outdoors, especially when there are a multitude of state parks that offer just about everything you could ever want on-site. Once you experience the wonders of Georgia’s beautiful wilderness, you may say good-bye to pricey resorts for good. Tucked inside the beautiful Chattahoochee National Forest lies Unicoi State Park, a scenic area just a stone’s throw from the alpine village of Helen. This park gives you the feeling of being in the middle of nowhere without sacrificing modern accommodations like Wi-Fi. The park itself is brimming with activities year-round, everything from hiking and biking trails and a lake for fishing to sports facilities and picnic shelters. There’s also an on-site restaurant serving breakfast, lunch, and dinner, so you may never need to leave the park until your vacation is over. If you care to venture out of the state park, head to Bodensee for authentic German cuisine. This fine dining restaurant reflects the heart and soul of Bavarian-inspired Helen. They’re serving up lunch and dinner options so you can sate your appetite just about whenever you like. For a little more universal fare, head to Cafe International and enjoy dining with a waterfront view. This tasty eatery features fan favorites like the Reuben, French dips, and classic hamburgers. Locals and tourists alike love this place because of the homey vibe, view of the river, and good selection of international cuisine. Train enthusiast or not, you can’t help but have fun at Charlemagne’s Kingdom. This scale model railroad exhibit mirrors the German countryside from the Alps to the sea. This work of art is about as unique as they come, and you’ll appreciate the fine details and craftsmanship put into this beautiful project. Enormous and intricately crafted trainset installation created by Willi and Judi Lindhorst depicting "Germany from the North Sea to the Alps." Nick in photo for scale. Aside from its notoriety as a German-focused town, Helen is also known as a river tubing destination. During the warmer months, you can rent a tube from Cool River Tubing and cruise down the Chattahoochee (don’t worry, their bus will bring you back at the end of your trip!). They also feature a zip line, rock wall, and ropes course. This little park is situated in the midst of downtown Helen and is open to the public to enjoy. Here you get the best views of the town, along with a playground, hiking trails, picnic areas, and a charming gazebo for picture perfect moments. It’s also within walking distance to shops and restaurants in Helen. If you’re into off-roading, then you must travel to Durhamtown Resort. Established in 1991, Durhamtown has grown into the largest off-road resort destination in the country. Push the accelerator as you ride over 6,000 acres next to Jeeps, dirt bikes, 4x4 vehicles, and more. Trails vary in experience level from beginner to expert. Make your trip a vacation by renting onsite lodging, staying at an RV site, or camping. You can’t go wrong at the Durhamtown Resort. The Whissenhunt OHV Trails are about six miles north of Dahlonega, Georgia, in Lumpkin County and offer 11.2 miles of ATV heaven. The trails are open sunrise to sunset and require a daily fee or annual pass. Trails are designated from beginner to difficult, and riders are asked to stay squarely on the trails so as not to disturb the surrounding nature. Highland Park Resort in Cedartown, Georgia, boasts over 90 miles of trails throughout the Georgian mountains. The trails are rated from beginner to expert with five levels, along with a PeeWee track. With 45 unique one-way trails, riders have the luxury of choice. Never have the same Highland adventure twice. Make sure to take a look at the trail map to see which trails are open to ATVs and which are restricted to motorbikes. For longer stays, consider one of the cabins. Happy Birthday to my dog @irfan_g05! Have a good one old man! Come on down to Waycross, Georgia, for Fat Daddy’s ATV Park. Situated on 500 acres in the Satilla River region, Fat Daddy offers miles of trails right by the river. Primitive camping sites are available for anyone that wishes to stay the weekend. Fat Daddy is open weekends, Friday-Sunday, and charges differing rates depending on how many days you plan to stay. Riders under 15 years of age must wear a helmet at all times. Make sure to check the website ahead of time for updated rules and regulations. Chattahoochee National Forest is one of the most beautiful and expansive forests in the state, with a combined total area of over 850,000 acres spanning multiple counties. Tons of trails are sprinkled throughout the forest, but take note: riders can only go on trails that are specifically designated. Depending on which trail you choose in the forest, you may be required to pay a daily fee. Check up on all of the rules and regulations on their website before stopping by, and take a look at the forest map while you’re there. When it comes to location, Georgia’s got it made: from beautiful beaches to impressive mountain scenery and everything in between, there’s no shortage of the great outdoors in the Peach State. Which also means it’s one of the best states in the country to enjoy Mother Nature’s annual show of fall foliage. Take a drive or train ride through Georgia’s Blue Ridge Mountains and you’ll see a never-ending landscape of yellows, oranges, and reds just begging for a photograph. Or, get out on foot and explore all the natural beauty up close in these five stunning foliage hikes in Georgia. About an hour’s drive north of Atlanta you’ll find the tallest cascading waterfall in the Southeast that sets the backdrop for the most beautiful fall foliage in the Peach State. Spend a night in the lodge or embark on a guided day hike to the falls. The views are spectacular, plus you’ll have every opportunity (and desire) to fill your Instagram feed with some of the best scenes you’ll see this fall. This popular hiking destination is a favorite year-round, but particularly in October when the leaves start to change. The trail system here takes you directly across the gorge, where you’ll find an impressive view of Tallulah Falls from up high surrounded by gorgeous fall foliage. The hikes here aren’t as difficult as they are tiring, since there are hundreds of stairs to the suspension bridge and hundreds more to reach the bottom. However, if you prefer to skip the steps, the trails offer several rim-side overlooks that give you amazing views without the effort. No matter what your skill level, there’s a hiking trail here that will give you an amazing up close view of the fall colors. As one of the largest parks in the state, this park plays home to beautiful canyons, caves, waterfalls, sandstone cliffs, and plenty of wooded areas that are set ablaze with color in October. Along the trail system are plenty of overlooks for photo opportunities of the sweeping expanse of brilliant fall foliage. Also known as the “Georgia’s Little Grand Canyon,” Providence Canyon is well known for its naturally sculpted rock facings and colorful soil. In addition to being a mini tourist attraction, the canyons are a prime viewing spot for those who enjoy fall foliage. There are several overlooks around the rims of the canyons that offer magnificent views of the fall-colored flora, each of which are accessed by the network of trails in the park. Also home to one of the biggest and most anticipated Oktoberfests in the country, Helen also plays home to some of the prettiest fall foliage you’ll see anywhere. Head to Unicoi State Park, where you can jump on a three-mile trail that leads from the park to downtown Helen. Along the way, you’ll get your fill of lovely fall sights. Or, opt for the longer Smith Creek Trail that leads you directly to Anna Ruby Falls. ATV off-roading isn’t just a fun activity, it’s a southern tradition. Throughout the Peach State you’ll find plenty of vehicle-friendly trails and parks that can give you a ride of a lifetime. However, no off-roading day in Georgia is complete without soaking up a little local flavor before you hit the homeward trail. Make the most of your next off-roading adventure in Georgia with this perfectly planned trip. Start your journey with a morning stop at Town Square Cafe. This cozy little eatery has some of the best breakfast in town, including all your favorites like biscuits, pancakes, and omelets. Guests love the quick, friendly service here, and the prices are reasonable, too. Before you start your off-roading adventure, stretch your legs at Prater’s Mill, one of Dalton’s most beloved historical sites. The structure itself dates to 1855, when it was a functioning mill for cornmeal. Situated on the waterfront, the structure has been fully restored to delight future generations. Unless there’s been significant rainfall, head to Houston Valley OHV Trails, a system offering more than 25 miles of safe yet challenging trails. Unlike typical ATV parks, this site is dedicated strictly to riding. There are variety of loops that merge with longer trails so you can plot your course and make your journey as long—or short—as you want. If you want to make an entire weekend of off-roading, there are three primitive campsites here that are free to use. Once you’ve had your fill of hilly trail riding, head back to Dalton to enjoy a delicious barbecue dinner. They also feature other sure-to-please favorites, such as hot dogs, chicken, and Brunswick stew. This locals favorite is a bit of a drive from the trail park, but once you sink your teeth into their smoky-flavored meats you’ll agree it was well worth it. Just a few minutes’ drive from the rib shack lies your evening’s refuge. Right off the interstate, you can expect clean, comfy rooms that make the perfect place to unwind after a long day of off-roading. There’s plenty of free parking for your oversized vehicle, as well as free Wi-Fi and a pool to help you melt away the day’s stresses. Georgia is well known for its outdoor scene, offering plenty of parks, lakes, coastline, and mountains to suit any outdoorsman’s style. When the leaves turn colors and the days start to cool, people from all across the country flock to the Peach State for fall camping and other activities. Whether you prefer to camp along the shores of a lake or river or like the feeling of being in the middle of nowhere, these five perfect fall camping spots in Georgia are not to be missed. Surround yourself with majestic mountain views covered in fall foliage at this gorgeous campground. Situated between Blairsville and Hiawassee, this site is far from the hustle and bustle of city life and makes you feel as though there’s nothing else on earth than what’s in front of you. The campground itself is spacious, offering 95 campsites with plenty of privacy. It’s an ideal spot if you’re looking to unwind, either at your campsite or on one of several hiking trails. Located at the foot of Blood Mountain, this lovely state park with its glassy lake offers prime fall foliage viewing in the perfect camp setting. You can take your pick of camping cottages, RV sites, or backcountry sites that will let you camp the way you want to. And even though it might be too cold to take a dip in the lake, campers can enjoy a host of other amenities and activities, including hiking, geocaching, fishing, and mini golf. A family favorite year-round, this amazing park is culturally engaging and perfect for a fall camping spot. Nestled against a waterfront vista, campers can rent an RV or yurt, or pitch a tent at one of their primitive camping sites. The campground is adjacent to the famed Stone Mountain, which features several popular attractions for the whole family, including their famous laser light show when the sun goes down. The waterfalls here are reason enough to visit, but this state park is also a prime camping destination for fall getaways. Rich foliage abounds, and is only brightened by beautiful cascades and the park’s lake. Campers can choose from a yurt on the waterfront or a spacious campsite to satisfy their lodging needs. Take advantage of the trail system here that winds its way through the majestic forests and lets you experience the best sights of Georgia in the fall. Home to the legendary Okefenokee Swamp, alligators, and other wildlife are the main draws to this locale. As the country’s largest blackwater swamp, there’s plenty of mystery lurking beneath the surface. Campers love coming here in the fall because wildlife sightings are almost a guarantee. It’s also a premier fishing destination, with bluegill, catfish, warmouth, and bowfin just waiting to grab your line. Consider taking a guided pontoon boat tour of the swamp, or rent your own vessel for a daring expedition. From oceans to mountains and everything in between, Georgia’s got hiking trails for all kinds of outdoor scenes. Having the right hiking gear as you set out to see it all can make a huge difference in your trip’s success. From shoes and apparel to backpacks and hydration, a walk in the woods is anything but unless you’re fully prepared. Given Georgia’s burgeoning hiking community, it’s no wonder there are myriad retailers that are just as dedicated to hiking as you are. They’ll have everything you need to fuel your passion for the outdoors, and maybe even a few little luxuries you never knew you needed. Your adventure starts here at these seven excellent hiking stores in Georgia. If you think all hiking and outdoor stores are the same, think again. Kevin’s continually brings new, unique items to the shelves. Their fun, upscale store ambiance adds to the overall shopping experience. And even though they’re a small, single location store, you can still find top brands like Yeti, Nebo, and Patagonia. Whether you hike alone, with the kids, or bring your canine friend along, you can find everything you need to outfit your next hiking trip at Blue Sky. They carry a little bit of everything for nearly every woodland adventure, including backpacks, water bottles, and gear for your dog. Choose from trusted brands like Marmot, Patagonia, and the North Face, to name a few. Sorel Boots and Smartwool socks will always keep your toes warm! The entire North Georgia region is a hiker’s paradise, so it’s no wonder the area features one of the best hiking stores in the state. The folks here do whatever it takes to make sure you’re prepped for your adventure, everything from providing the right apparel and gear to offering directions to the trailheads. Inside you’ll find some of the best names in hiking, including Keen footwear, KAVU bags, and ENO. You’ll come as a shopper, but leave as a friend. As it goes with Georgia, large urban sprawls aren’t far from stunning wilderness which makes High Country Outfitters an excellent place to visit for all your hiking essentials. Inside you’ll recognize brands like Marmot, Chaco, Osprey, and MSR, to name a few. From packs to knives to apparel and more, you’ll find everything you need and more. Visiting my uncle Greg at work and checking out @highcountryoutfitters collection of ruffwear. I like what I see. If you want the best in hiking gear, it pays to go to the experts who have first-hand expertise of what you can expect. Talk to the folks at Alpharetta Outfitters, who can help you find what you need the first time without having to make a second trip somewhere else. As fellow outdoor enthusiasts, you’ll benefit from their knowledge of the area and they can direct you to some of the best trails around. From area maps and watches to water bottles and clothing, you’ll find brands like Orvis, Patagonia, and Yeti, among others. Their name says it all: they’re experts on our outside world. From clothing and hiking boots to backpacks, dog leashes, and dry bags, you’ll get everything you need for a quick trail, day hike, or backcountry camping adventure all under one roof. Choose from beloved brands like KAVU, Sealline, and Black Diamond. Save the Hemlocks! From now thru our event on October 28, we will be selling $1 raffle tickets for some pretty sweet items from our vendors. Be sure to come by the store and check it out, all proceeds go to Save Georgia's Hemlocks, inc! Nestled in the Blue Ridge Mountains, there’s no better guide to hiking in the area than the team at Blue Ridge Mountain Outfitters. If you’re hiking nearby, they’ve been where you’re going and know what you might need to make your hike both enjoyable and safe (there are bears in the mountains, ya know!). Patagonia is a cornerstone brand here, offering reliability, functionality, and quality in every item. Georgia’s hunting season includes an abundance of bow-only days, so it’s no surprise that the state is brimming with fans of the sport. Here you’ll find no shortage of archery shops dedicated to helping hunters nab their prize, along with all the expertise you need to make your purchases work right. To help get you field-ready even faster, prioritize a trip to one of these 10 best archery outfitters in Georgia. You won’t find a better place for archery gear and expertise. Their fans love them for their deep level of product knowledge and above-and-beyond customer service. They carry a wide selection of Mathews and Mission bows, and also offer service for Mathews and other brands. Offering some of the best archery gear and service, locals love the Foxhole because of their reasonable prices and impeccable attention to detail and service. For hunters who aren’t strictly by the bow, you get the best of both worlds all under one roof. Let’s be honest, good bows don’t come cheap. If you’re looking to own the best, the guys at Diamondback Archery Shop can help you finance your purchase. Their customers appreciate how easy they make the financing process and how the shop delivers on what they promise. For gear, repairs, or just advice, you’ll learn from the best at Archery Learning Center. Every trip here is an experience, giving you top0notch service from fellow bow hunters who share your passion. They also offer a variety of classes for kids and adults alike. It’s not a large shop, but there’s plenty to be found inside. From service to sales, the pros here know their stuff when it comes to bows. Archery is all they do, so you can rest assured that they do it right. One of the best things about Wildcat Archery is their indoor range. Fans love coming here for target practice on a rainy day (or any other time) to hone their skills and get expert advice. They also specialize in all the goods for bow hunters, competitive archers, and recreational archers. Tucked just above Atlanta, this place is the mega store of archery. With over 10,000 square-feet of store space, there’s no way you can’t find what you’re looking for when it comes to gear and accessories. In addition, they also carry a full range of firearms to complete your hunting or outdoors experience. As the only archery pro shop in Harris County, Columbus Archery recognizes its obligation to the outdoors community to provide top-notch gear and second-to-none service. They cater to competitive archers and bow hunters alike, offering bow tunings, custom arrows, and all the accessories. They also feature archery leagues and instructional courses to help you get more out of the sport. If you’re looking for a customized archery experience, you’ll want to make the trip to Treetop Archery. They’ll make sure you get the best equipment for your needs and skill level, along with bow setup and other services. You won’t find a better set of professionals to work with. Specializing in all things outdoors, the team here takes a particular interest in archery. They have a full archery product line along with two skilled techs with over two decades of experience. As a result, you get some of the best technical service in the state, along with a one-stop shop for all your outdoor gear. New hats are in ready for spring! From the largemouth bass of Lake Allatoona to the red snapper of the state’s coastal waters, Georgia attracts visitors from all over for its fishing opportunities. Of course, to catch your share you’ll first need to suit up with the right gear, which you’ll be able to find at these 10 best bait and tackle shops in Georgia. If you’re heading out for a day on Lake Lanier, you’ll want to stop at Oakwood Bait & Tackle first. This full-service shop can provide all your fishing needs and point you in the right direction for a successful day of fishing. They’re the area experts, and love putting their firsthand knowledge to work for you. Offering the best in live bait and tackle in the area, Buccaneers knows fishing like no other. They’ve always got a good selection to cater to your offshore and inshore fishing needs. Combine that with friendly hometown service and you’ll never want to go anywhere else. Not only do they offer a huge selection of live and artificial bait, they’re also right next door to a filling station for the human appetite. You can stock up on snacks, beer, and deli items to prevent you from abandoning your fishing spot in search of food. This one-stop shop’s convenience is valuable to its customers, which keeps them coming back every time. This drive-thru bait shop is truly one of a kind! Close to Lakes Allatoona and Carters, you can expect the best bait for the fish here. The experience alone is worth the trip. Bait, tackle, and dry ice are what you’ll find at Angler’s Corner. You can stock your cooler with groceries while you get your gear to save you from making another trip elsewhere. They offer discounts on bulk bait purchases of $100 or more, perfect if you have a large group for your fishing trip. This hometown bait shop is an icon of its community. Aside from their friendly service and area knowledge, you can expect a good variety of bait and other gear in one of the cleanest, most well organized bait stores you’ll ever step foot in. You’ll come for the bait, but you won’t be able to ignore the beautiful view of the waterfront you get while shopping. 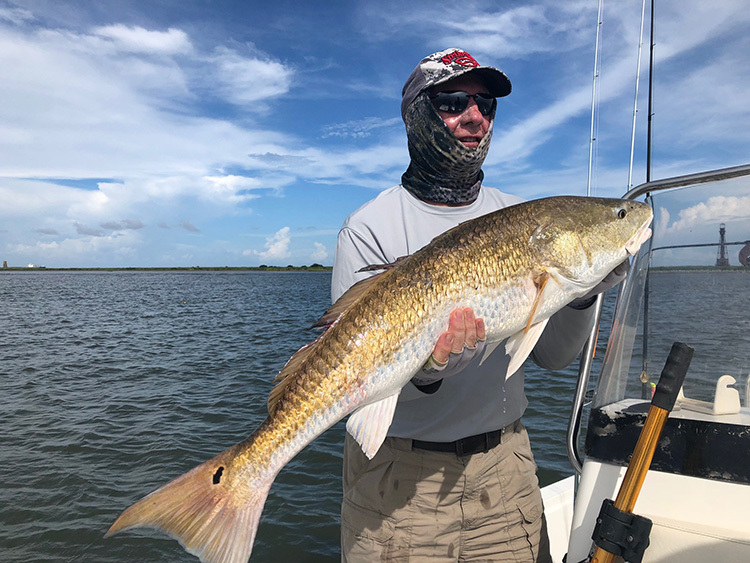 This Tybee Island favorite features all the bait you need for a successful day of fishing in the area, backed up by experts who know the area well and can put you on the right path. Customers love coming to St. Simons Bait & Tackle because they know they can get quality frozen bait and gear at affordable prices. You can’t help but feel like family when you visit, as the staff makes sure to serve up a dose of southern hospitality the Peach State is known for. In business for over 30 years, Hammond’s has built its reputation on trust, quality, and value. They’ve proven themselves to be the Lake Lanier experts when it comes to fishing and can help you get exactly what you need. They’re open every day year-round (minus Christmas Day) to offer you every possible chance to pursue your passion. Truth be told, there isn’t much to do in Bainbridge outside of fishing. That’s why the area is lucky to have a dedicated bait and tackle shop that can cater to the fishing community here. Get your license, ice, supplies, gas, and other necessities all in a single stop. In Georgia, it’s not uncommon to see several different species of birds on a daily basis. The Peach State is brimming with hundreds of bird species at various times of the year. Birdwatching is more than simply spotting birds as they fly overhead, it takes the right timing, knowledge, patience, and planning if you want to catch sight of something spectacular. For many travelers and locals in Georgia, birdwatching is the real sport of champions. Head to one of these five best birdwatching spots and test your skills! With nearly 350 species of birds coming to nest and roost, your chances of sighting one of Georgia’s most diverse bird populations is pretty high here. Woody Pond is home to the endangered wood stork. The refuge itself contains a variety of salt marshes, wetlands, freshwater ponds, hardwood forests and fields that continually attract birds to the area. Bonus points: their website offers an eBird tracker that can notify you about recent bird sightings. Home to nearly 200 species of birds, this 35,000-acre wildlife refuge offers plenty of viewing opportunities for serious birdwatchers. Inside the refuge, you’ll find a network of several hiking trails, along with the six-mile Wildlife Drive and 45 miles of gravel roadways that take you through the area for prime viewing. Most commonly seen here are varieties of warblers, woodpeckers, wood ducks, herons, hawks, chickadees, flycatchers, and wild turkey, to name a few. Neotropical songbirds are in abundance in April and May, while winter waterfowl are most likely seen during the cooler months. @ninja_birder and I chased two Trumpeter Swans today! The 274th tick on my Georgia list - 300 is gradually getting closer. The Owl’s Roost Tower gives visitors a 360-degree view of the swamp and surrounding areas, perfect for bird spotting. Wading birds are no strangers to the area, and you’ll likely find plenty of sandhill cranes, egrets, herons, and the endangered wood stork. Kingfishers, woodpeckers, and bobwhites are also heard in abundance here. Situated on the outskirts of Atlanta, Sweetwater Creek is a hidden gem in this major metro. The reservoir in the park is a prime fishing spot, which also makes it attractive to ducks. The park’s trail system takes visitors up rocky bluffs above the rapids and through fields and forests teeming with birdsongs. Over 300 species have been spotted here, including bald eagles, ruby throated hummingbirds, wood storks, and egrets. Migratory birds rely on this park as a resting and refueling spot, so prime viewing is in full swing in the spring and fall months. Located on Cockspur Island, this park is home to much more than a national monument. During your visit, you have a strong chance of sighting one or more of its bird species, including bald eagles, wood stork, or terns. Pelicans and other wading birds and waterfowl are regular visitors here, as well as raptors, hummingbirds, woodpeckers, and finches. The park plays an important role to painted buntings, whose neotropical homes have largely been lost. If you catch sight of this beautiful gem, consider it a treat.